Rachel Cotterill, Rebellion. Independently published, 2010. Pp. 418. ISBN 978-1452846323. $14.99 paperback / $0.99 e-book. Rebellion. A strong, stirring title; grand yet also with a sense of serious intent rather than just outrageous impetuousness. It brings to mind great, stirring images of conflict and change, thesis crashing into antithesis, producing a new synthesis. That is not what Cotterill’s novel is about, and it actually took me some time to twig that the ’rebellion’ is a one-woman show against the expected formula of her life. But in the style of the book, and through the attitudes of other characters that should be the formative, conflicting experiences for the heroine but are instead rather more laid-back about her aims, this is a condition that is for the most part accepted without the need for tears, tantrums or ‘overcoming’. For, despite the title, the actual rebelling part is remarkably small-time and quietly dropped. The story opens a view into a new fantasy world, based on quasi-High Renaissance and populated with stock characters one would expect to find in any half-decent fantastic oeuvre, minus the magical element: humans-only, although there are some minor tremors over race and Orientalism. In this place we learn that within the Charanthe Empire, where the ruling classes run on an organised system of cause and effect (the right jobs for the right people, leading to a higher efficiency of output), certain privileged schools turn out future administrators, law-keepers, scientists and law-enforcers. The children are also orphans; given wholly to the schools and thereby the state, raising an idea of a potentially elitist oppression. Do not despair! For there is also the pre-requisite collection of ‘local colour’: the plebeian, working classes. This incorporates the merchants, lively local taverns, sailors, smugglers, warriors, gypsies and itinerants. To these happy folk the system that Eleanor, the heroine, has been raised in, is little more than an inconvenience of taxes, inefficient policing and general rough-housing. As a position for a heroine to rise up against, it does not have much going for it, and even the promise of a grey area in which to delve is lost among the confusion of potential, and then dropped, themes that Cotterill seems to have no patience with. Introduced in the prologue to the heroine as a child, we learn she is to be carefully watched and tutored by a mysterious fellow in the woods behind her school. Before this becomes too questionable, fast-forward over a decade to the final days of her schooling, and she and her friends await the outcome of their career choices (made for them by the state). Finding her official position below the level of her dignity and self-assessed ability, the confident Eleanor throws the old expected pathway up and runs away to find out more about a semi-mythical group of assassins and secret society types she has read about. What follows are her adventures in doing just that; falling in with smugglers, dungeons, questing, challenges, and then, come the second half of the novel, the challenges of the hidden college for that secret society. Through this she holds her own, to arise, a fully trained agent (effectively) by the end, leading us into the second novel following her professional adventures. When I was much younger, I loved a sequence of books by Tamora Pierce, following the adventures of Alanna; a girl masquerading as a man to become a knight in a fantastical setting. Unlike those childhood favourites, Cotterill’s world studiously avoids all magical suggestion; a very practical created world. The comparison holds up better for the heroines: strong-willed girls who are fighting to prove themselves in a man’s world. But where Alanna was emotional, interactive and recognisable to an excitable young mind, Eleanor is considerably cooler. To begin with I found her self-possession and almost un-emotional reactions supremely irritating. She appears entirely too confident and logical for a youngster from a sheltered upbringing alone in the world for the first time. I could forgive errors made out of an immature, inexperienced judgement, and indeed such errors help to develop a character for reader and writer alike and are what made exploring Alanna’s world through her eyes so memorable. Instead I rather got the feeling that Eleanor was studiously, somewhat creepily, assimilating information like a computer testing an experiment and collating resulting data. Cotterill tries to add a layer of causality to her character by implying a ‘woman against the odds.’ A woman as an adventurer? Male characters scoff! But instead of oppression by gender discrimination, instead of flying a flag for feminism we have a character that gets her head down and carries on. Opposition—real, difficult opposition—melts away in response. It would be nice to think that Cotterill is trying to show an alternative feminism: get on and do and prove yourself, but if there really is a ‘glass ceiling’ in this world she has made, the implied ‘impossibility’ of breaking from the norm, then it is too flimsy to make a point. There is nothing for Eleanor’s get-on-and-do character to ‘rebel’ against. The men who oppose her most (indeed, the only ones to oppose her) at the assassins’ college are products of the misogynistic programming of the all-male school they came from: a boys’ only club that cannot admit women are as able, if different, to the strengths of men. Eleanor also comes across as inhumanly able to cope with inner conflict; the tension of which normally helps to add depth and relatability to a character. As the set-up, her training and schooling has prepared for her a mindset that considers the processes of the Empire irrefutable and organised She expresses (we are told) surprise that her Empire does not always get it right, or more firmly control the inhabitants of the wider swathes of land within its boarders. Eleanor does show some surprise to begin with that its logic and equality of work ethic (women are permitted to hold office, but denied physical roles in assassination or soldiery) does not always succeed and is even considered next to laughable by non-urban citizens. But her own desire to adventure, to track down the assassin college; her confidence in being able to succeed at such a school, is in direct contradiction of these ideals. Yet never does her focus waver, never is there any consideration that she is expressing a contradiction, and no lesson is learned from such. After some thinking and unpicking, it could be that Cotterill is exploring how one’s programming plays a forceful role in producing parroted aphorisms, but is not the boss of us if we strive for our individual aspirations. Likewise, the ‘secret’ training Eleanor received from the mysterious man in the woods; physical training, knife throwing and general tough-girl-ness, instilled in her the idea she could become an adventurer, and is itself a type of programming. The ‘Rebellion’ of the title, then, is not a grand, political upheaval of expectation but rather the breaking of Eleanor’s programming. This is a subtle message, so subtle that Eleanor shows no sign of having learned it herself. Still she classifies her ‘rebellion’ as the intentional move away from the State-sponsored plan of her life; still using her old definitions. Therefore, I have come to consider it as the product of my own reaction to the book, in attempting to find a reason behind Cotterill’s writing. As a take-home message the first and primary impression I had was of an emotionless Vulcan of a character. And if it were not for the overall ‘meh’-ness of the attitude of other characters toward the seriousness of the Empire’s structural systems and punishments, then the idea of rebellion against State and a state of mind as controlled by the State would be a lot more powerful. Any commentary on the disparity of thought and action between the higher echelons (the schools, the lifestyle and expectations Eleanor was raised in) and the common people (the cheerful, rambunctious lives of working folk) disappears into a narrative drive that hangs primarily on a series of physical adventures. If we still want to derive ‘meaning’, then exploring feminism in relation to a female protagonist might be one way in. But even here, the character of Eleanor fails. The main emotion she does display; the one that sends her off her default mode of lone-wolf-ness into mood swings and tears when she is having ‘issues’ in her early 20s at the college, is that of first love. Captured while attempting to collect information on the college, she shares a cell with another proto-student, a young man she bonds with over their shared incarceration and torture. Held by ‘exotic’, ‘foreign’ powers, Eleanor is moved to notice how different this place is compared to the order of her home Empire, how smelly, and different, and awesome it is; typical Orientalism. Indeed, this might say something about the ‘Western’ character of Eleanor and her people; possibly stir up some provocative commentary on how one deals with the Other. But, no; torture happens because it makes for dramatic plot, not because Eleanor or her companion are going to learn anything. Eleanor’s memories will seem dim and dark of that time because of the physical depravation and what she learned about surviving as a good little fighter from her cell mate. Heaven forefend that the action is held up by consideration! Later on she has to leave him behind to return and warn the college about the kidnapping of candidates by distant powers; a warning that is dismissed along the liens of “we know already, old news”, utterly deflating the impact of her experiences. She does manage to gain admittance to the college, but continues to mope on and off about her lost friend. The one insight into her soul is the main affectation primarily ascribed to the feminine as a weakness in the paradigm of classical story telling: love and affection. What kept me reading was not Eleanor’s scintillating company but rather the intensity of the world Eleanor inhabits: majestic, detailed and colourful. Huge attention is lavished on interactive detail with the locations and characters. Considerably less time is spent in describing how any of the ingenious devices might work, just as the character motivations are left unclear. The underpinning (meta-)physics of the world are kept a mystery, even if recognisably ‘normal’ by the standards of our reality. There isn’t even a map (normally a staple of fantastic fiction) to guide the reader in the dimensions of the places described! Yes, it does mean the reader is free to choose their own ideas of the places brought forth, but, considering all the foregoing above, this is not a book based on deep social discussion,. This is an action film in book form; for that very reason some visual prompting is entirely acceptable, and, indeed, necessary. Plot is entirely driven by finding the next piece of the quest. Cotterill has developed her cinematic set-pieces, and boy, will she employ them! Consequently I truly felt as if I were in the events themselves; much as an adventure film will draw in the viewer with flashy scenes and exciting moments. A film adaptation of the book would not be hard to do, neither would finding a suitably dead-pan heroine among the modern trend of pretty-but-soulless performing by young actresses. This is solid fantasy; very solid. Geographically gorgeous with shallow characterisations, this is not a demanding read. The binding does not help: the cover image is a total non-starter. It bears no relation to any of the interior, and is off-putting. Indeed, I showed the cover and described the story to two different friends and both agreed, unanimously, that the cover was “crap” to the purpose. A wooden shack? 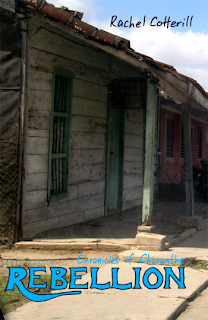 It brings to mind a plantation drama; a Caribbean mystery. Definitely not a middle-fantasy genre piece. Finally it comes down to a simple question: would I read the next books? Yes, I would. Because the action is lively, the descriptions juicy and the reading is easy and fun. I would want some serious work done on Eleanor to help her develop organically as a person, instead of an oversized plot device. Too much of that cold fish and I could get turned off pretty quick. And I want a map!